The Jakhu Ropeway is a Cable car in the town of Shimla “Queen of hills “ in the Indian state of Himachal Pradesh. 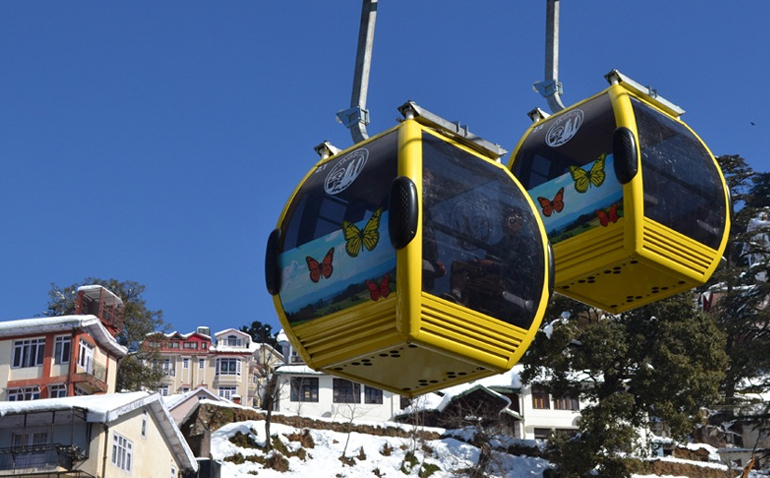 The Ropeway is a popular tourist destination in shimla giving breathtaking views of Himalayan hills. Tourists have been enthralled by the perfect management and the safety of the gondolas. With only 6 minutes ride, one can easily visit the Jakhu Temple while enjoying the beauty of forests. Shimla is one of India's most popular hill resorts, buzzing with a happy flow of Indian vacationers and full of relics of its previous life as the summer capital of British India. Traffic is banned from the central part of town, so walking is pleasant – even when huffing and puffing uphill. The long, winding main street, the Mall, runs east and west just below the spine of the hill. South of it, the maze-like alleys of the bustling bazaar cascade steeply down to traffic-infested Cart Road.